Photo credit: Brian Vossen. 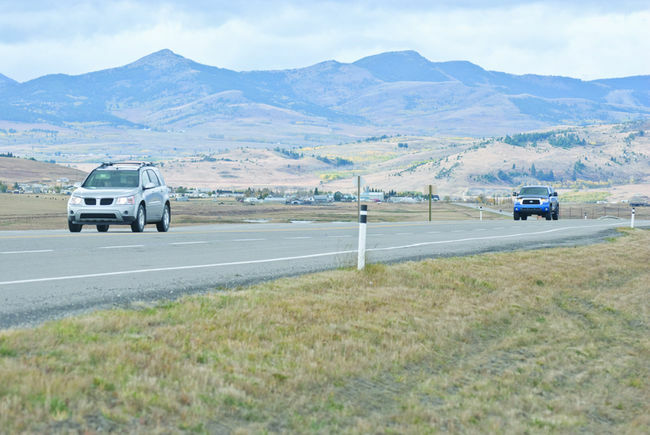 Cars travel westward on Highway 3 near Lundbreck. A new study has identified a number of high collisions sites and proposed wildlife crossing improvements for them. Anyone who drives in rural Canada knows that feeling: you’re driving along a highway and suddenly you spot a deer standing near the shoulder. Sometimes several. If you’re lucky you see them and if you’re luckier still, you see them in plenty of time to slow down. This experience is all too common on Highway 3, particularly between Fort MacLeod and the B.C. border, but a group of committed wildlife experts would like to change it. Along with Road Watch and Fish & Wildlife, conservation biologist Dale Paton has been working on a project that aims to reduce wildlife-vehicle collisions along Highway 3. A joint project, called the Highway 3 Corridor Project, is an undertaking of the Miistakis Institute, the University of Calgary, the Yellowstone to Yukon Conservation Initiative and the Alberta Motor Association. Paton said there is a high number of wildlife-vehicle collisions along Highway 3 that have a high cost both economically and socially. The team identified a number of high-collision sites and two of the highest priority areas have been proposed for wildlife crossing improvements. The first is a narrow corridor near Crowsnest Lake where big horn sheep often come in search of salt. Paton said the project would include fencing for several kilometres with “jump-outs” that would direct the animals off the highway. The second is near Rock Creek Road where there is a high mortality of bear, elk, moose and deer. An underpass with funnels and fencing on each side of the highway for one to two kilometres has been proposed for this area. These two sites have been agreed upon as the highest priority and have been presented to Alberta’s Ministry of Transportation and Alberta Environment and Sustainable Resource Development. Paton said government officials are supportive but no commitments for installation have been set. A cost-benefit model that shows that the societal cost is higher than the price of preventative measures has been developed and may be used around the world, said Paton. Large highways being built in the U.S. and Europe are using the same principles to provide wildlife crossing solutions, he added. 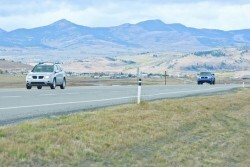 According to AMA, about 7,500 vehicles travel Highway 3 daily. Because the highway breaks the Crowsnest Pass valley in half, there is a significant safety risk for both people and animals. These two criteria alone should make us want to mitigate the risks, said Paton. The project targets a variety of species and also includes an educational component. Paton said many drivers think animals on the side of the highway will turn around, but animal behaviour is not always straightforward. There are certain areas for instance where the habitat is good so animals may consistently try to cross in those areas. Development along the highway has also limited good crossing areas, making it harder for animals to pick their spots. “We know these areas maintain the connectivity of wildlife and the cost to the public demands it a lot more than it used to,” said Paton. He suggests that there is more awareness than there used to be of the loss to the community with wildlife-vehicle collisions. The Highway 3 Corridor Project could also be part of the Crowsnest Pass’s brand to say we value wildlife. Paton said the M.D. of Pincher Creek sent a letter to Alberta’s Minister of Transportation in support of creating areas for wildlife to cross Highway 3. He added his team will be pursuing a letter from the Municipality of Crowsnest Pass as well.